Prix indiqué par personne. Disponible au prix de 35€ avec une coupe de champagne et 15€ pour les enfants (de 4 à 12 ans). 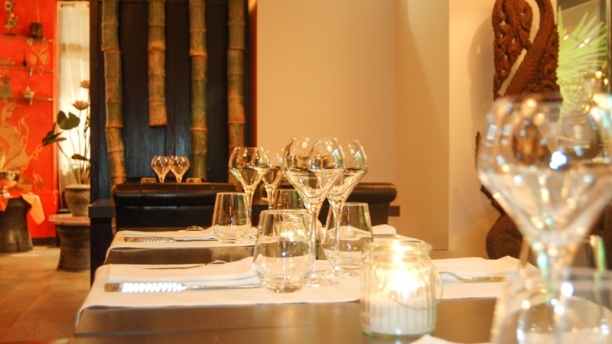 "A THAI AT PASSY - Located a very short distance from the metro of Passy and with views of the Eiffel Tower, Aux Trois Nagas presents the best of Thai cuisine in customized surroundings, combining noble materials and typical motifs, reflections of Thai art. CHANGING MENU - Depending on the seasons and market products, the chef redeveloped the menus (new tasting menu). As a true ambassador of its country's culture, it offers authentic cuisine although some specialties have been adapted to our Western palates. ELEGANCE AND FINESSE - For dessert, the chef gives free rein to his creativity, allowing us to set aside the traditional sweets in Durian style, so difficult for Europeans to appreciate." The reasonably-priced brunch (29 euros) of tasty Asian dishes (pork curry, chicken satay, shrimp nem) plus salads and desserts is all you can eat. we had brunch, selection is relatively small but enough to fill the tummy....authentic , excellent choices of hot and cold dishes, desserts are divine and the service is prompt and welcoming! Will recommend highly and return in future! Delicious Thai flavors at reasonable prices. Don’t believe the ratings - super average food, dark decors...totally overrated !! Super brunch !!! Très original. Delicious Thai flavors at very reasonable prices. Consistently good Thai dishes at very reasonable prices.